With preservationist tongues wagging in anticipation of the proposed “modern” structure at 27 Cranberry Street, we thought it would be interesting to open up the discussion regarding some of the neighborhood’s other “controversial” structures. We’ve just scratched the surface, so please add your suggestions in the comments below. As for how it got that way, Brown Harris Stevens broker Gabriel Ford told the Brooklyn Eagle, “Sometime after 1940, someone removed the front stairway, added asbestos shingles, created a side entry and added a two-car garage…In their mind they probably thought they were modernizing it, but it looked horrible.” Cranky preservationists aside, the one car garage here makes it a sweet deal for some. 222 Columbia Heights – The demolition of the Cornell Mansion (built in 1865) in the mid 1950s was one of the motivating events in the Brooklyn Heights historic preservation movement. In 1982 a new structure took its place. 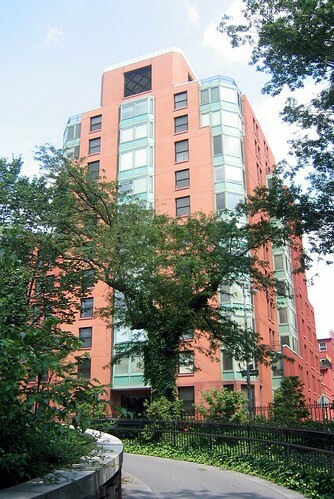 123 Joralemon Street – In 1993, architect Joseph Stella was commissioned by its owner, Malcolm Fein, to do minor renovations to the structure, a modest suburbanesque home. He proposed a larger project utilizing the maximum amount of space allowed by law on that lot. The result of his vision is the modern carriage house featured on the 2008 BHA House Tour. However, not everyone in Brooklyn Heights seemed to be tickled by this new addition. The Brooklyn Eagle’s Henrik Krogius is also not a fan saying it “lacks any depth in architectural detail; it is flat as a stage backdrop… [the] “1950′s one-story ranch-house building that [that 125 replaced] though certainly a curiosity in the Heights, ought to have been preserved as part of the Historic District”. Jehovah’s Witnesses Dormitory and Library Facility – 119 Columbia Heights, built in 1970, is one of the earliest designs in the area post landmarking. The main portion of the building screams 1970s “futurama” while the attached row house facades keep it from stinking up the vibe rest of the block. And in 100 years, preservationists may be kvelling the work here by Ulrich Franzen as much as they do over an 1800s brownstone. What buildings would you add to the list? A couple of footnotes – The award winning rebirthing of 36 Grace Court by Tom van den Bout and Brenda Nelson created a new benchmark for righting the aesthetic crimes of past generations. Time will tell if the owners (or future owners) of properties such as 27 Cranberry, the Poplar Precinct, 100 Clark Street etc follow their example. Where Luca Brasi Met the Fishes? 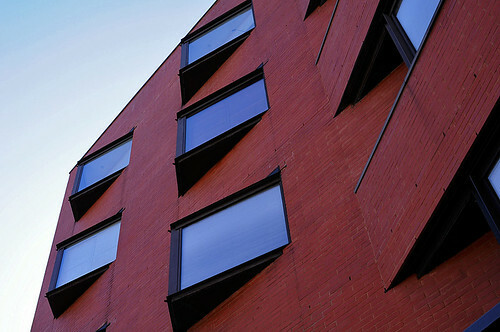 322 Hicks reminds me of a red version of a dorm I lived in in college that was designed by a prison architect. I’m surprised you don’t mention the neighbor of 322 Hicks St which is unimaginably, infinitely uglier.How on earth was it ever given a pass by the LPC but then, quis custodiet ipsos custodes? @cb – thanks I’ll look up and revise. Why the hate on the little carriage house? 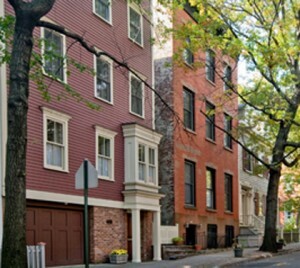 There were carriage houses in Brooklyn Heights. It looks far better than those prison-styled hellholes. Build more fake carriage houses! What about Cadman Towers which replaced several Greek Revival townhouses on Clark Street? 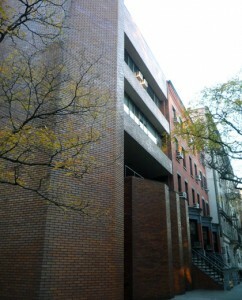 The building at the top of the article seems reasonably harmless – the color of the brick matches that of its neighbors and the lines are mostly square and not on weird angles. By contrast, the Jehovah’s Witnesses Dormitory and Library Facility is a real blight – it doesn’t attempt to complement its surroundings or match the human scale of the Heights. (I believe that’s what they called “brutalism” back in the early 70s.) I hope current builders can learn from past mistakes in all this. Cadman Towers is by far the biggest travesty, both in scale, concept, and in style. The Witness “Dormitory and Library” building on Columbia Heights is stunning while the Margaret Apartments is a small step better than socialist modern housing in East Berlin. Just wait and see what will rise in the old garden at 20 Henry Street. After a few years of fighting with the original investors on size and placement, it seems an exhausted Landmarks did not care if 3rd rate architecture was situated in the old garden as long as it was a relatively small structure. I think that the new central addition to Bridge Harbor Heights (across the street from 20 Henry) which was designed (I believe) by Charles Platt is successful. A good look at that structure might be in order before new ones arise in empty spaces. The way buildings are approved in this part of town these days *usually* prevents anything terrible being built in a residential area, but it also prevents anything good from being created that will be worth preserving 100 years from now. I was down by fulton fish market the other day (think beekman street, peck slip, etc), and I was really impressed at how many brilliant contextual modernist structures stood cheek by jowl with some of the oldest buildings in our city. It definitely bears study. Ahh, but were those new structures built to the maximum allowable size? That’s my main beef with the 27 Cranberry proposal – the McMansion aspect. Modernism isn’t the enemy; bad architecture is. Who could possibly object to a modernist building if it were designed by someone with the talent of, say, Frank Lloyd Wright? A lot of people, Topham. Sadly so. I’m in your camp, but there are a lot of people who would rather have a fake federal style brick sh*thouse (with steel frame and subzero appliances, of course) than a Renzo Piano or David Adjaye building in the neighborhood. Look at what happened when Walentas wanted to put a Jean Nouvel structure in the park! People went ballistic. And yet we were being gifted a free structure by a world class architect for all to enjoy. It isn’t a matter of modernism (whatever one means by THAT) vs. the traditional (which can’t be recreated honestly anyway), but rather of suitability. That has to do with scale and appropriateness to the site and community. One mustn’t buy an architectural “brand” simply because it’s hot, or even if it’s superlative, without carefully considering that one lives intimately with the buildings in one’s neighborhood, day-in, day-out.